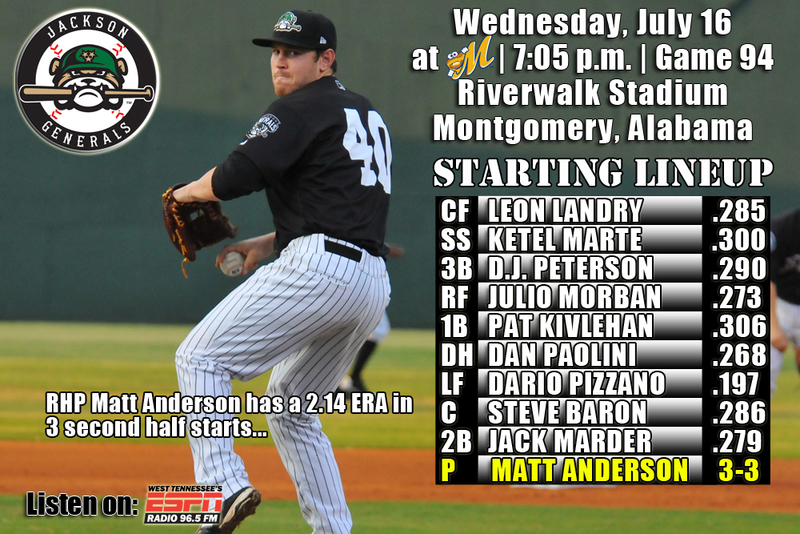 • The Generals open a 5-game series in Montgomery tonight at Riverwalk Stadium…Jackson is coming off back-to-back series victories at HVL (3-2) and vs. BIR (3-1)…have won 6 of 8 overall…will play 15 games with Montgomery over the course of the final 46 games, 10 coming at Riverwalk Stadium. double-header on Wednesday, August 13 when the Barons return to Jackson. • 15 of Jackson’s final 46 games of the season will be played against the Montgomery Biscuits and 10 of the final 25 road games at Riverwalk Stadium. • As a team, the Biscuits are hitting just .218 during 13 July games, but they lead the Southern League with 18 home runs. They hit just 20 during the entire month of June. • The Generals have posted double-digit hit totals in 7 of last 8 games (12 last night) and batted .314 (87×277) over their last 8 games, winning 6 of those, scoring 50 R on 87 H with 15 2B, 6 3B and 11 HR. • Jackson ranks 2nd in the league doubles (170), 2nd in triples (33), 4th in slugging (.390) and 3rd in batting (.263) on the season. • INF Patrick Kivlehan currently has a 7-game hit streak, batting .385 (10×26) with 8 runs scored, 1 double, 1 triple, 1 home run, 5 RBI and 2 walks. • INF Dan Paolini has hit safely 10 of 11 games appeared in July, batting .385 (15×39) with 7 runs scored, 4 doubles, 3 home runs, 9 RBI and 2 walks. • OF Dario Pizzano has hit safely in each of his last 7 games, batting .417 (10×24) with 7 runs scored, 2 doules, 3 triples, 1 home run, 10 RBI and 4 walks. • INF Ketel Marte currently has a 5-game hit streak, batting .417 (10×24) with 2 runs scored, 2 doubles, 1 triple and 4 RBI. • OF Leon Landry has hit safely in 15 of his last 16 games, batting .315 (23×73) with 9 runs scored, 3 doubles, 1 triple, 4 RBI and 7 stolen bases. Since June 7, Landry has hit safely in 27 of his last 30 games with 15 multi-hit efforts, batting .350 (43×123) with 19 runs scored, 6 doubles, 3 triples, 7 RBI, 3 walks and 12 stolen bases. During this 30 game stretch he has raised his season average from .236 to .285. • 3B D.J. Peterson has hit safely in 14 of 15 games with Jackson, batting .290 (18×62) with 8 runs scored, 4 doubles, 3 home runs, 7 RBI and 4 walks.